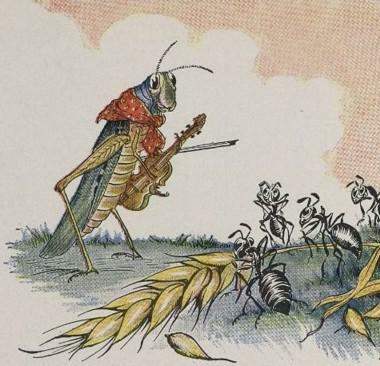 The Ant and the Grasshopper, also known as The Grasshopper and the Ant (or Ants) is one of the most famous of Aesop's Fables. This fable's moral lesson emphasizes the twin values of hard work and planning for the future. This story is featured in our Favorite Fairy Tales, Pre-K Read-Aloud Stories and Children's Stories. You may also enjoy reading this fable's parady in rhyme, titled The Impecunious Cricket and the Frugal Ant. Add The Ant And The Grasshopper to your own personal library.